Manolo says, it is the Friday. Time to kick off the shoes of obligation and put on the shoes of fun! And the shoes of the Isaac Mizrahi, they are nothing if not fun. This entry was posted on Friday, April 29th, 2005 at 12:13 pm by Manolo the Shoeblogger and is filed under Isaac Mizrahi, Sandals, Shoes. You can follow any responses to this entry through the RSS 2.0 feed. Both comments and pings are currently closed. Sorry, but the Mimi she is not so impressed with these shoes. The first pair, they cannot make up their mind whether to be wedges or heels. 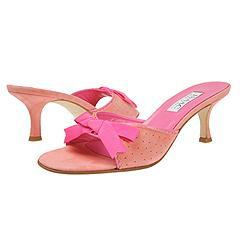 The second pair, the pink of the bow clashes with the pink of the upper and heel. The third pair, she does find to be cute but not so extraordinary as the shoes the Manolo usually presents to us. i do not like these shoes either. (perhaps they suffer from such close proximity to the manolos?) if there is a trend naming shoes after philosophers, i’d like to reserve a pump named epictetus (and maybe a sandal named marcus aurelius). Oh, joy! Those are happy shoes. I am often frustrated with the shoes of the slides. For some reason, I cannot wear them – my feet twist, and I end up walking off of the heels. Could Manolo please attempt to show us more of the shoes of the slingbacks and the ankle ties for the summer?